Sitting in your office chair is uncomfortable, isn’t it? Sat in one posture for hours on end with the occasional trip to make a coffee or toilet being the only break you get. You find yourself every half an hour or so needing to have a little wiggle and a stretch because you end up slouched over working away. Sitting in one place for so long isn’t ideal for our bodies and the problem is increased when your posture is wrong and when we sit in a chair for long periods, concentrating on other things, it becomes easy to forget about your posture. 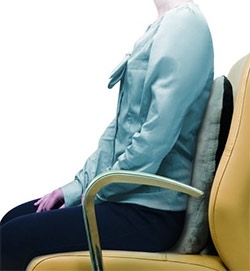 Bad posture in your chair can place strain on already sensitised muscles and soft tissues. This strain may increase tension in the muscles, which may in turn cause back pain. Having bad posture can have an effect on how you perform at work, to long sat in the wrong position can lead to headaches and fatigue and the back pain that is a result of bad posture can affect your sleep which will only make the next day even worse. As you can see its imperative you address bad posture. You don’t have to become an expert at yoga to improve your posture and you definitely don’t need to change to a standing desk. A Posture Support Seat Cushion will ensure your posture stays correct throughout the day so you don’t leave work feeling like you have an actual weight around your shoulders. The posture cushion just sits comfortably behind your back on your chair and quickly corrects your posture in 3 ways to prevent back pain. Side supports- these cradle your spine to hold your spine aligned and straight, this ensure the pressure is evenly distrusted across your body to avoid imbalances that cause pain in one side of your back. Micro-beads- microbeads give support to your lower back that is firm enough to ensure you remain upright but still soft enough that it remains comfortable. The Posture Support Seat Cushion has a soft and comfortable cover that is easy to clean, grey on one side and black on the other, it can be used on either side you prefer. Whether your at the office or at the computer at home protect yourself from back pain with the Posture Support Seat Cushion.